Found 2 file extension associations related to SkyMap and 2 file formats developed specifically for use with SkyMap. 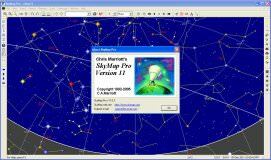 SkyMap is a sophisticated star charting and planetarium program for Microsoft Windows 98 or later. It can display the sky as seen from any location on earth for any date between 4000BC and 8000AD, showing fields of view ranging from the entire visible sky down to a detailed telescopic "finder chart" for a faint galaxy. SkyMap has been designed to appeal to the novice, or the more casual astronomer. For those with more demanding requirements, we also offer the more sophisticated SkyMap Pro product. If you need more information please contact the developers of SkyMap (SkyMap Software), or check out their product website.